Mykonos island is a popular tourist destination in the Greek islands of the Cyclades group, situated in the middle of the Aegean Sea. Mykonos Town (Chora) is a stunningly picturesque Cycladic town with a maze of tiny streets and whitewashed steps lanes, houses and churches, gathered around its harbor in the middle of a wide bay. It is famed as a cosmopolitan destination amongst the Greek islands and widely recognized as one of the great travel Mecca’s. Although the streets are lined with little shops, boutiques, art galleries, cafes, stylish bars and restaurants, Mykonos Town has not completely lost its identity. Despite the island’s rapid growth and development, it’s traditional Cycladic architectural style and character has remained firmly intact, thanks to the island’s strict building regulations. 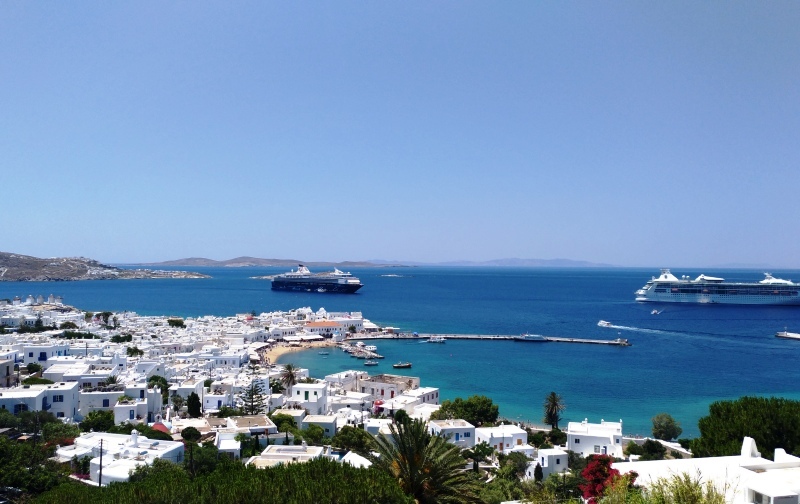 Mykonos tends to be extremely crowded with visitors in July and August. The best time to visit Mykonos is May through June, or September through mid-October. -The Windmills, are one of the most recognized landmarks of Mykonos. Once this island was a great producer of wheat and bread. The area of the windmills has a splendid view on Little Venice and is the most popular place in Mykonos to watch the sunset. -Little Venice, a district located at the sea, famous for its picturesque medieval two and three storey houses, which stand like a wall above the sea, and their colorful wooden balconies. Little Venice is one of the most beautiful and romantic places in the whole of Mykonos and offers a fantastic sunset. -Panagia Paraportiani, of all the churches on Mykonos, the most impressive is Panagia Paraportianí, a true Byzantine jewel. This whitewashed church, which building dates back to 1425 and was not completed until the 17th century, is the most popular and most photographed of all the churches on Mykonos. -Petros the Pelican, the island’s mascot, can sometimes be found at the waterfront or even up in town. Now there are three pelicans inhabiting the island. This means that the Petros you meet, can be a Petra. Well, this is Mykonos.